The Sub Ring is the missing 5-channel analog mixer section of your modular, especially tuned to play well with oscillators. It features a ring mod, 2 sub octaves, and a noise generator. It adds character, volume, and depth to your synth voice. 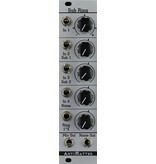 All 5 channels are summed at the ‘Mix' output and have 1.5X amplification. A mix out and dedicated white noise output are provided. Use the Sub Ring to fatten and add depth to your patches! • DC- coupled to facilitate experimentation with CV signals! Control Voltage is a music instrument shop in Portland, OR specializing in analog & digital synthesizers, modular synths, MIDI & DIY stuff. Hello!